The Fellowship was fortunate enough to obtain a copy of UNCLE SCROOGE #1 from IDW Publishing. The stories are written by Rodolfo Cimino, Alberto Savini, Romano Scarpa and Luca Boschi. The art is by Romano Scarpa, Giorgio Cavazzano, Andrea Freccero and Sandro Del Conte.The colors are by Digikore Studios, and Disney Italia (with David Gerstein), and lettering by Tom B. Long. Translation and dialogue is by Jonathan H. Gray, David Gerstein, and Joe Torcivia. “Pure Viewing Satisfaction” – Donald doesn’t understand Uncle Scrooge’s “unique” appreciation of his brand new television. 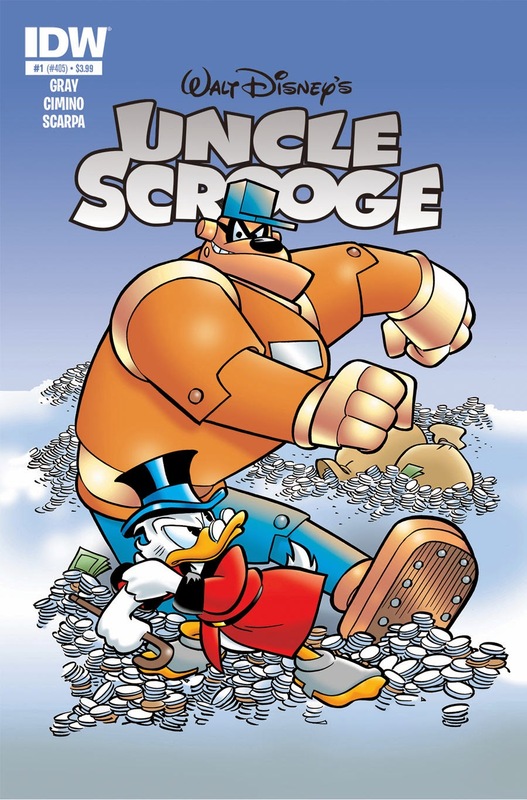 “Tinker, Tailor, Scrooge, and Sly” – Someone is VERY interested in Uncle Scrooge’s coat and will do anything to get it. But what is so special about this coat? It’s not that valuable…is it? UNCLE SCROOGE marks the return of the Disney characters back into comics. There are some fun, enjoyable stories that anyone of any age can enjoy! It’s so great to see them back and I can’t wait to read the other books. UNCLE SCROOGE #1 is in stores now, or available for ordering at www.idwpublishing.com.